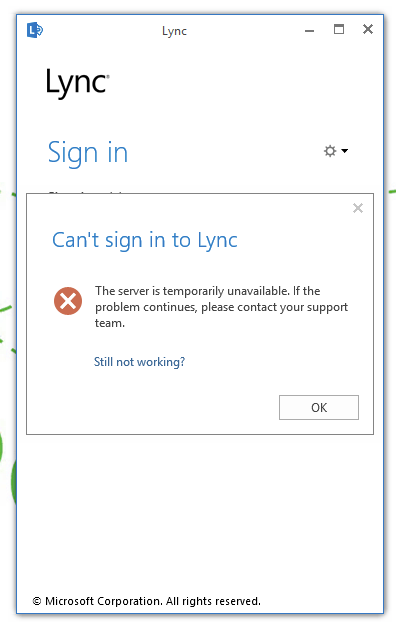 Since our Office 365 tenant was upgraded we’ve been experiencing difficulties with our users signing into Lync 2013. When these users tried to sign in, the Lync 2013 client returned an error saying it could not communicate with the server. The users received the following error. Firstly our IT guy raised this issue with Office 365 through a support ticket some months ago when we started experiencing this issue. There was some back and forth communication however no solution was ever found. As far as I know the issue is still open. A few months passed and I was getting more and more frustrated that I wasn’t able to communicate with my team using Lync so I decided to spend sometime and see if I could find a solution myself. After reading countless forum posts I noticed many others were reporting similar issues and the issue seemed quite widespread. So after some research I read that Microsoft were aware of the bug and did not expect it to be resolved until September time. Others were saying that it worked with users who’s machines where not joined to an Active Directory domain. This lead me to think about try using a local account and there it is folks – my solution! This is a less of a solution but more of a work around whilst Microsoft fix this issue once and for all! I should highlight that some features such as creating a Lync meeting through Outlook might not work due to the processes running as different user accounts. Try it out for yourself and see. Fingers crossed Microsoft fix this issue pretty soon!